Exercising in your Endless Pools swim spa on a regular basis offers numerous mental health benefits. In this stressed-out society, swimming in your Endless Pools swim spa is a welcome respite, as swimming has been proven to be a relaxing agent, reducing stress levels. Swimming may do more therapy than counseling, as it boosts your endorphins and feel-good emotions (as a result of the increased heart rate and mental exertion.) It increases your mental endurance and toughness. It boosts your self-esteem and confidence levels. Swimming in an Endless Pools swim spa for exercise prevents brain shrinkage and boosts memory retainment, creating new brain cells. The full range of body movement through water stretches you out, releasing tension you may build up from a long day or week. The sound of breathing and water rushing in your ears helps you filter out distractions and focus and/or meditate internally, reducing stress levels and depression/anxiety. It is comparable to a session of yoga without the hassle of paying for a membership and commuting to a scheduled class session. If you’re looking for a way to boost the psychological and mental well-being of your household, consider investing in a swim spa for your home, if you don’t already use one. And, just maybe, you’ll qualify for the Boulder Ironman! 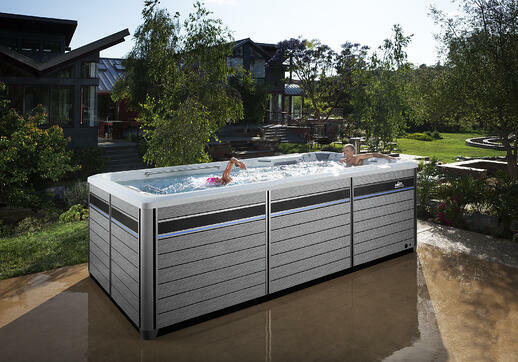 For more information on our Endless Pools Fitness Systems, go to ihtspas.com.